ABC's World News this week failed to mention the development that former New Jersey Democratic Senator and former Governor Jon Corzine is mired in a scandal involving $600 million in missing funds from the financial firm MF Global which he headed until today. 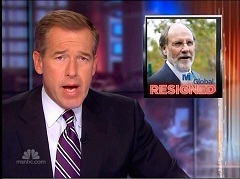 The CBS Evening News and the NBC Nightly News so far have not mentioned Corzine's Democratic Party affiliation as they ran full reports on Tuesday, and on Friday both shows updated viewers after Corzine's resignation. Jon Corzine is in the midst of a spectacular fall from grace. He was the head of Goldman Sachs, he was a U.S. Senator, and later governor of New Jersey. Well, his latest job as head of financial brokerage firm MF Global came to an end today. The firm failed four days ago. Over $600 million in customer funds is missing, and the whole enterprise is now under investigation. Corzine has hired a prominent criminal defense lawyer. SCOTT PELLEY: There were some developments today in the collapse of that Wall Street trading firm, MF Global. The head of that company, Jon Corzine - who is a former U.S. Senator, former head of Goldman Sachs, former governor of New Jersey - he resigned today. What are the developments there? ANTHONY MASON: Well, he, in resigning, Scott, he gave up a $12 million severance package, and, in a statement, said he felt great sadness, but he did not apologize for the collapse of the company, and investigators are still looking for $600 million in missing customer money.